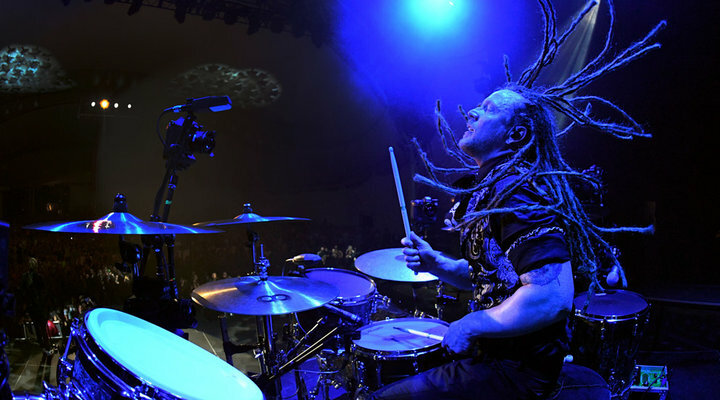 "Even though I wrap Barry Kerch's kit with cameras for Shinedown shows," Mike Corrado says, "I do have favorite positions. This one's stage left, towards the front and over the top of the cymbals. I like it because I feel I'm standing right with him at the best spot in the house." D5, AF NIKKOR 14mm f/2.8D ED, 1/200 second, f/6.3, ISO 10,000, aperture priority, Matrix metering. "I need to be alert all the time—some of the best moments happen when Barry is connecting with the audience, as he is here. And if color isn't adding to a photo's impact, I'll convert the image to black and white to see if that strengthens it. Here I felt it did." D5, AF NIKKOR 14mm f/2.8D ED, 1/500 second, f/7.1, ISO 10,000, aperture priority, center-weighted metering. "Barry always brings passion and energy to his playing, but it's a bonus to have his dreds in full flight. This image works on all levels: color, composition, mood—and two hands, two sticks." D5, AF Fisheye-NIKKOR 16mm f/2.8D, 1/1250 second, f/6.3, ISO 10,000, aperture priority, center-weighted metering. "I shot this with the 200-500mm lens on one of the cameras I had with me as I worked from the pit and the stage. One of the things I do, especially when working with a drummer for the first time, is to isolate him from the other band members to capture expressions when he's engaging with the audience." D5, AF-S NIKKOR 200-500mm f/5.6E ED VR, 1/1000 second, f/5.6, ISO 6400, manual exposure, Matrix metering. "Studying the music and spending time going over the set list with Barry gives me a good sense of what may happen. That, and checking websites for videos of Barry playing through specific songs." D5, AF-S NIKKOR 200-500mm f/5.6E ED VR, 1/800 second, f/5.6, ISO 6400, manual exposure, Matrix metering. "Setting auto white balance for concert shots makes the most sense, as many shows have drastically changing lights and conditions, and my Nikon DSLRs will make better and faster color decisions than I can. And when a gel color tends to match the intensity of the drummer and the moment, I know I've got a dynamic, dramatic photograph." D5, AF-S NIKKOR 200-500mm f/5.6E ED VR, 1/640 second, f/5.6, ISO 6400, manual exposure, Matrix metering. If you want to do it right, here's what you shoot for: two hands, two sticks. That's the advice Mike Corrado received when he asked Journey's drummer Steve Smith what drummers look for in a photo, and that's what Mike's aimed for during ten years of photographing rock drummers from the pit in front of the stage, or from the stage itself, or, most recently, when he places his remote cameras. Remote photography is Mike's ultimate access, hard-earned through years of building a reputation on respect for performers, following the rules and delivering great photography. For Mike, who is a senior manager at Nikon, remote photography is just the latest step in what he strives for in his images of drummers: in a word, more. "Every time you go out, you learn more about how to do it," he says. "The more you learn, the more you can do, and the more you want to do. The first time I did this what I prayed for was a sharp image on the frame—that's it, and that's all. Just be sharp." But as his experience and skills grew—and imaging technology advanced—so did the possibilities of more. Mike's access to bands started with local groups, small clubs, networking among contacts, world-of-mouth recommendations and making the most of every opportunity. His main interest and the emphasis of his photography was the drummer. "Drummers are always at the back of the stage and the rear of the publicity shots," Mike says. "I never saw them getting the attention I thought they deserved. The drummer is the power of the band. He dictates the pace, and if he's off, everything's off. His beat is the beat of our hearts to the music." Early on, as Mike was shooting a band, somebody said to him, "Make sure you show the drummer some love," and with those words, DrummerLove became simultaneously the name of his project and its purpose--to put the drummer in the spotlight, and in doing so, spotlight his ability to create dynamic images. It was easier to sum up than accomplish. The big problem: "I couldn't get there." "There" was the perfect position for a clear image of the drummer at the heroic moment hardly anyone sees. Mike calls it "the pilot image—you know, the fighter pilot in the cockpit, surrounded by all his stuff." From the pit or the stage, he couldn't get there consistently. "You've got cymbals, stands, maybe microphones—all kinds of hardware and obstructions blocking you from making the picture." So he took advantage of technology, and with the permission of drummers and band members, and often with the help of drum techs, he set up remote cameras. Blood, sweat and tears later, it's paying off. The stage-left, rear remote captures Barry in action when he turns to this side of the kit and fills the right side of the frame. "The 16mm fisheye gives me amazing coverage of the kit while getting a dramatic, emotional image." D5, AF Fisheye-NIKKOR 16mm f/2.8D, 1/800 second, f/6.3, ISO 10,000, aperture priority, center-weighted metering. The 16mm fisheye was on the stage-left, low-angle remote camera. "When I have to position a camera in tight, that's the workhorse lens for capturing larger-than-life hero images. At times I duck behind the kit to shoot with my hand-held cameras to get different angles and opportunities. I always wear black to reduce the chances of being seen by the audience. Can you spot me here?" D5, AF Fisheye-NIKKOR 16mm f/2.8D, 1/320 second, f/7.1, ISO 10,000, aperture priority, center-weighted metering. Setting remotes above the cymbals provides the best chances for clean, open shots. "It's a great place to use the 14mm lens to get the wide-angle views I want." D5, AF NIKKOR 14mm f/2.8D ED, 1/500 second, f/6.3, ISO 10,000, aperture priority, center-weighted metering. "Captured by the stage-left front remote, this is my favorite shot from a concert in Brooklyn, New York, in July, 2016. Barry is up out of the saddle, two hands and two sticks in view, looking incredibly powerful. I never lose sight of my objective: make the subject look amazing and feel good about the work we do together." D5, AF NIKKOR 14mm f/2.8D ED, 1/500 second, f/6.3, ISO 10,000, aperture priority, Matrix metering. Mounting cameras towards the sides of the kit, at the rear of the rig, provides views of the crowd and anything cool that may be happening, like the lighting of cell phones. "The kick of the red gels adds to the mood and mystique of the image." D5, AF NIKKOR 14mm f/2.8D ED, 1/30 second, f/6.3, ISO 10,000, aperture priority, Matrix metering. "That's me, taking my own picture by firing the stage-right remote. Each of my hand-held cameras has a WR-1 transceiver mounted on it that triggers the WR-R10 receivers plugged into the WR-A10 adapters in the cameras' 10-pin ports. Every time I trigger one of my carry cameras all of the remote cameras fire." Before we get to how Mike does it, let's address the obvious: because he works for Nikon, he has access to lots of gear. The thing is, though, you don't necessarily need a lot. "The advantage of remote photography isn't in the number of frames you get," he says, "it's in how you use the technology to tell the story of whatever your passion is. One camera, maybe two, will expand your possibilities and creativity. One perfectly-placed camera blows away nineteen." All it takes to start is one remote-capable camera with a wide-angle lens. "Get it close, head-on to the drummer, without interfering with his line of sight to the audience, and that's it." Today Mike optimizes every opportunity by using five or six cameras positioned in and around the drum kit and remotely triggered, and two cameras with him in the pit or, if he has permission, on stage. Often he'll choose the locations for the remotes prior to or during the band's sound check, sometimes working with the drum tech as he sets the cameras in place. "I have to get a look at the drum kit when I'm shooting a band for the first time," Mike says. "Sometimes I get that look online, sometimes it's when I show up at the venue. If there's a framework for the cymbals instead of stands, that's gold—I can use clamps on the frame instead of on cymbal or microphone stands. The thing I have to avoid is blocking the drummer from the audience—he's hard enough to see as it is. It's like putting a puzzle together when I work with a drummer's kit for the first time." For the photos accompanying this story, here's what came into play: D5 and D500 cameras; four NIKKOR lenses (14mm f/2.8, 16mm Fisheye, 24-70mm f/2.8, 200-500mm f/5.6); WR-1 transceivers, WR-R10 receivers and WR-A10 adapters; Manfrotto Magic arms, ball heads and Super Clamps; and countless zip ties. "Zip ties are my best friends," Mike says. "I trust the clamps, but I use the ties to back them up just in case something loosens from vibrations. Stuff is getting hit all around the cameras, and I can't have a camera fall into the kit or drop to the stage—that'll be the last time I'm allowed to work with that band." When the show starts, Mike might be on the stage or in the pit at the front. The two cameras he's carrying will be fitted with WR-1 transceivers that send signals to all the remote cameras, which are fitted with WR-A10 adapters and WR-R10 receivers. Every time Mike triggers one of his carry cameras, all the remotes fire. The lenses on the remotes have been manually focused according to their distance from the drummer, with f/stops (usually in the f/5 to f/7 range) chosen to provide some depth-of-field wriggle room. The remote cameras are set for aperture priority, center-weighted metering (most of the time) and -2/3 exposure compensation ("to avoid any areas of the frame that might blow out the highlights"). Mike likes to shoot RAW files so he can make adjustments if the exposures need a little help. Positioning the cameras starts with logic and common sense—simply, where are the best places to view the drummer?—but it's been refined and adjusted over time by knowing the drummer and the band's set. Where does he turn? Where does he look? Does he stand up? How high does he lift his arms? How are the lights going to hit him? To get the kind of privileged access Mike often enjoys, the drummer has to trust him. "He has to know it'll be safe," Mike says. "That the cameras won't interfere, and the results will be worth it: high resolution, high quality, high concept. He has to know that I'm going to produce images that will be as close as possible to putting the viewer right there with him, so his role in the band will be seen as well as heard. Frankly, he has to know I'm going to make him look good. The way I see it, my job, my responsibility, is to make the artists look amazing. If I do that, I'll be asked back." The drummer in these photos, Barry Kerch, of Shinedown, has that kind of faith. "About seven years ago I'm at a show, setting up for another band," Mike says, "and Barry shows up ahead of Shinedown's sound check. He sees me setting up a D300S, and he says, 'Are you going to shoot a movie with that?' I say, 'How do you know I can shoot movies with this?' and he says he owns a D300S. We get to talking, and later on I send him photos I'd made of another drummer, with a note: 'Would you ever be interested in doing this?' You can guess his answer." "The alignment and leveling of remote cameras is vital to the look of the venue and the images I'm trying to create. The D5's virtual horizon graphic indicator gives me the pitch and yaw visual I need to be as precise as possible." "Once the remote cameras are in place, I engage the eyepiece cover so no stray light comes through. I use the information display on the back LCD to check my settings and make adjustments on the fly." "At times I'll be several hundred feet from the drum kit—maybe in the pit, on the side of the stage or somewhere else looking for an interesting angle. I turn on each remote D5's image preview feature so the LCD panels light up and I'll have confirmation that the cameras are firing. It's critical towards the end of a show that I know everything is working well and I haven't filled the memory cards." "Me again, in the forest of hardware. I usually have about 30 minutes to get everything set once the drum kit is built and placed. I want to be set and ready for sound check so I can run tests on the remotes, then make needed adjustments and tape down the lenses I've manually focused." "Incredibly important to my success is the band's drum tech. There's not one I've worked with who hasn't been amazing. Shinedown's tech, Mark Bennett, is so committed to the project that he helps place the cameras and often makes recommendations for placement that results in pictures I never would have gotten otherwise. Here I caught us in our 'That's all, folks!' pose by triggering the stage-right remote." "Ninety percent of this game is half mental," Yogi Berra said of baseball. His observation is true of photography as well. You need a purpose, a plan, a system, lots of patience and a tolerance for disappointment and frustration. There's trial and error until you lock down the procedure, and even then there's error. "You have to stay focused, and I'm not talking about the camera lens," Mike says. "You have to be aware of everything that's going on as you're setting up. A momentary lapse and a camera isn't turned on and won't fire for the whole show—and of course it's the camera that's covering a precise, important angle." Or a camera can be bumped after you set it up, and there's no way you can know that, so you end up with 5,000 out-of-focus pictures. "That's happened," Mike says. But what happens more often are photographs like the ones you see here: the moments, the looks, the energy, all in hero images. "I know the set list," Mike says. "I know when the drummer's going to hit hard and when he's going to lay out. I know when the lights will change, when the pyrotechnic display will go off." He knows one other thing: the importance of the drum tech. For Shinedown, that's Mark Bennett, and his cooperation, patience and expertise played a part in every picture you see here. Sometimes there's the unexpected—something cool that happens just when he starts thinking he can't do anything that's different or unusual. "I'll get a slightly blurred photograph," Mike explains, "but it's a revealing blur that captures more than any frozen split-second, because in that moment of movement you see the drummer's style, his expression, his emotion. It's something new, something more, and I got it." There's much he has to be aware of before, during and after the show, but there's one commitment to honor above all. "You have to show respect for the band, the drum tech, the road manager, the tour manager, everyone. You show that you're a professional, just as they are, and with respect and professionalism you build a reputation." And then you give something more. "I'll send photo files to the drummers, and sometimes a band's manager or agent will ask for photos for their use. I always give those, too. All I ask is that the band make a donation to a charity—most often to Ronald McDonald house. "We're all gifted to be able to do what we do, and we have to give something in return." Mike Corrado's title at Nikon is senior manager, pro relations and marketing business development. His website, corradophotography.com, features the full range of his photography, from sports and action to portraits and performance. There's also a link to his blog, which offers tips, techniques and the stories behind selected images.